It’s that time of year again..time to hibernate! Chop wood, get cosy and wait…It is also a month of Christmas markets and time to get organised for next year. It was lovely to see new faces and also old ones returning. It was great to welcome Ali- who worked on our spinning courses as well as Ele, Joany and Jane who came back for more. We are making a few changes for next year adding a few new bits here and there, including our new Indigo dyeing weekend in May, which includes shibori and batik. Fi Oberon will be returning in May to help run our Fleece to Felt week, which this year will end with an option to either needle felt or wet felt. We have been looking at needle felting Venus figurines and the tree of life..so if anyone needs inspiration, Fi will be bringing ideas and samples to help along the way. Ali will be back teaching on our Dye to Spin weeks and Joany will be there in September running the yoga on our craft retreat. If you are interested in joining us next year for a weekend or a week have a little peek at the dates so far. If you are interested in giving a friend or family member a slightly different kind of Christmas present, we can send vouchers out for both our weekend and week long Escapes. If you would like to follow us on Facebook or look at all the lovely pictures we put up on Instagram please click to do it! Felting weekend– April 27th-28th: Wet felting with our own naturally dyed fleece. Get the chance to make a large wall hanging or other smaller items. Indigo Weekend (Shibori & Batik) May 11th-12th: Enjoy a totally blue weekend -the magic of Indigo, learn both shibori and batik techniques. 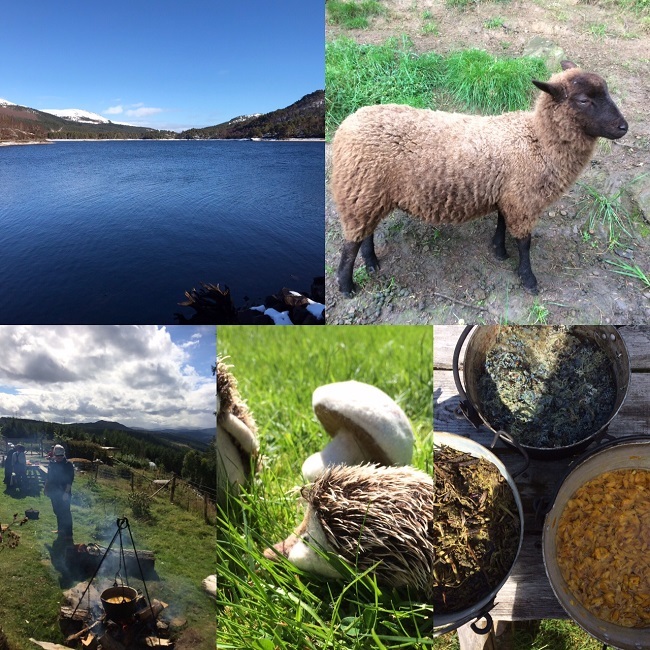 Fleece to Felt week (with Fi Oberon) May 25th-June 1st : Immerse yourself in everything woolly -watch Alex shear one of our Shetland sheep, learn how to sort and wash fleece, forage for dye plants and dye your fleece a beautiful range of natural colours. Spend the last two days needle felting, wet felting or a bit of both. Natural Dyeing weekend June 8th-9th: Spend the weekend creating stunning colours from natural dyes. Dyeing un-spun fleece. Learn to wash and sort fleece, make natural dyes and dye the fleece a beautiful rainbow of natural colours, spend two days learning to spin with Ali. Eco-printing weekend August 10th-11th: Learn how to print with flowers, leaves and other natural dyes, on silk and cotton. Craft Retreat Sept 14th-21st: Enjoy a wonderful relaxing week, doing a little bit of everything we love…gentle walking, optional morning yoga and craft (including felting, natural dyeing and eco-printing. If you would like to no longer receive information from us please email back unsubscribe. Many thanks!